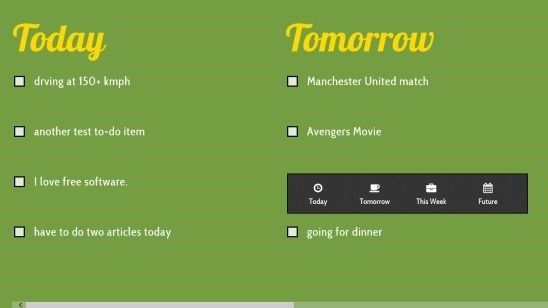 Check The Box is a free and simple Windows 8 To-Do app, which is extremely handy for making a list of important To-Dos. The app lets you add multiple to-dos in a list and later organize them according to preferences; you can keep these to-dos in four different categories: Today, Tomorrow, This Week, or Future. This makes it easier to remember stuffs that you have to do today, tomorrow, or in future. A single to-do can be upto 70 characters long, and you are allowed to use alphabets, numbers, special symbols like $,*,@,#, etc., to describe your to-dos. The app lets you quickly create a to-list and manage these to-dos. You can add anything that you want to remember or want to do in future, such as: going for a movie with friends tomorrow, or going for dinner with your wife this weekend, or skydiving one day in the future. Once added, you can always see the different to-dos directly from the live tile of the app on Start screen. This Windows 8 To-Do app is available under the Productivity Category in Windows Store. Chances are, you might not find the free app on first go, so here’s a thing that you can do: Open Windows Store, press WIN+Q to open the Windows Search Charm, type the app’s name, and make a search. You will then find the app and install it from there on your Windows 8 PC. The app’s interface is very basic and clean, and this makes it extremely easy to use. Plus the app also give hints when you use the app for the first time, and therefore makes it even more easier to use. As mentioned before you can create the to-dos based on on four categories. There’s no limit for the number of to-dos, you can add as many to-dos as you like. But there’s a limit to the number of characters in a to-do text. Adding a to-do is pretty easy. If you are on a PC or laptop, then simply make a right click; you’ll get the text box wherein you can give a one liner for the to-do. One thing that is appraisable in this app is that it does automatic spell check, which lots of other to-do apps don’t do. When you are done with everything press Enter key. Your to-do will get added to the list. You can also cut/copy-paste the to-do text if you want. Once you have added a to-do, you can easily put it in one of the available categories (by default it goes to Today’s list). All you have to do is click on the the desired to-do; this will open a list of categories from where you can simply select the category where you want to keep the to-do. Your to-do will then move to the desired category. Follows a screenshot of categorizing a to-do. When you are done with a particular to-do, then removing it from the list is also quite easy. Simply check that particular to-do, and it gets removed from the list. Free app for Windows 8. Lets you create and manage list of to-dos. Supports adding as many to-dos as desired. Four Categories: Today, Tomorrow, This Week, and Future. Auto spell check with suggestions. Options to cut/copy-paste to-do text. Quickly view the total number of to-dos from the live tile of the app on Start screen. Live tile also allows quick preview of the to-dos. Check The Box is notably a good Windows 8 To-Do app. It surely is a good medium that helps you remember events and stuffs that you have to do and makes your life easy. However, it would have been better if the makers had added option to customize screen color. All in all, the app comes with a good combination of simplicity with practicability. Definitely worth a try. Also check out Note Anytime, Sticky Note Apps, and TuTu Note we reviewed earlier.